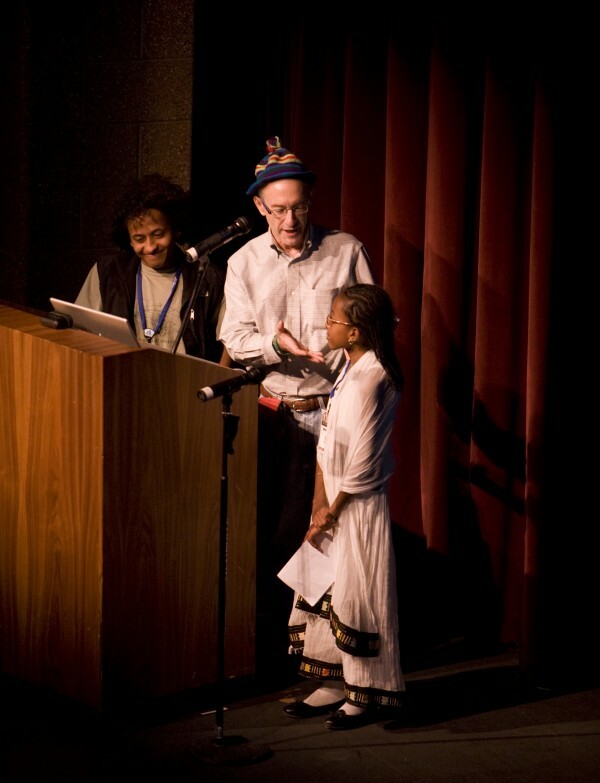 Last year Dr. Rick Hodes, who works with Ethiopian children who suffer from tuberculosis of the spine and whose story is told in Making the Crooked Straight, won the Moving Mountains Prize. His medical program was awarded $5,000, and with it he was able to help a young patient named Meiraf. Meiraf attended this year's festival, and read a moving letter to a full crowd at the Palm Theatre. It's another example of what we call the Domino Effect of Mountainfilm; using inspiration to truly make positive change. Last November, I left Ethiopia for the first time in my life. With no mother or father beside me, I was taken to Ghana for spinal surgery. As my body lay flat on the surgeon’s table, I remember seeing giant machines all around me. I had never seen such machines, and started feeling scared. But the medical team reminded me, that I was in good hands, and of how this surgery was going to be my second chance at life. Confident, I counted backwards from ten, and then found myself feeling sleepy, because I couldn’t hear the clash of instruments, that would soon be cutting through my back. My name is Meiraf Atanafu. I grew up with a deep love for education, but school was not my favorite place. You see, I did not look like the other kids in my school, and they reminded me of this, every single day. Getting teased by my classmates was not easy to ignore. The kids would laugh at me and say: “Aren’t you ashamed to be at school like this?” And they would call me horrible names, and the worst name of all was: “Gobata”. Gobata means big backed. I hate that name so much, because each morning as I would dress, I couldn’t help but stare at my reflection in the mirror, and wonder if that short girl, with funny fitted clothes, staring back at me, was really, just a Gobata? Wasn’t it enough for them, that when I played hide and seek, I would always lose? Wasn’t it enough that when I’d get close to tag my friends, I needed to stop, and wait for my lungs to catch up? And wasn’t it enough for them, that I was tired of going from doctor to doctor, only to hear the words: “ A cure like this, is not possible in Ethiopia”? But that wasn’t even the worst part. The worst was, having to see the sadness in my father’s eyes, when we this. But in my eyes, my father became my hero. Ever since I was born with scoliosis, he made it his mission to find me a cure. Keeping our fingers crossed we visited almost every doctor in Addis Ababa, my home country. But no miracle came our way. Because I wasn’t popular in school, I learned to appreciate the few friends I had. And even though, the teasing in school didn’t stop, I still felt lucky, because I grew up with a family that showed me so much love. My favorite part of the day was bedtime. When my mother would tuck my little brother Nahom and I, into our shared mattress. She would read us the most magical kind of stories. My favorite, of course, was the story of Cinderella. I loved hearing Cinderella’s story, because I felt that we were very alike. Just like Cinderella’s stepsisters, would make her feel bad and make her feel not important. I too, shared her pain, when the children in my class made fun of me. But one night, the sisters were invited to a beautiful ball in the Kingdom, and as usual Cinderella was forbidden to go, because as her sisters would say, “a maid has no place in a ball”. But that night, Cinderella met her magical fairy Godmother! The Godmother, understood Cinderella’s pain, and even though Cinderella didn’t know it, her life would be changed forever. A magical spell was then cast, turning her into the most beautiful girl ever. Suddenly, she was introduced into a whole new world. A world, where maids could become princesses, a world where people have second chances in life, and a world, filled with beautiful miracles. Like Cinderella, I too found a miracle. My miracle happened, the day that I met Dr. Rick, who also turned out to be my own magical fairy Godfather! My family and I heard all kinds of stories about an American doctor making miracles for people like me. This doctor was saving the lives of scoliosis patients, by magically turning their crooked spines into straight ones. Soon after, my father and I went to find Dr. Rick, and we found him working at the Mother Teresa Clinic for the JDC. When we were called into his office, I remember him sitting in his chair, and scribbling down a bunch of words on paper. Magical spells, I thought. With his glasses to his nose, he turned around, smiled at me, and shook my little hand. My little hand went up and down, up and down, again and again. He asked me what my name was, and I said Meiraf. Then he asked me what my fathers name was, I said Atanafu, and then, what my grandfathers name was, so I said Alemu, and then, what my great- grandfathers name was, and I said, “I don’t know?” and he said who is: “I don’t know?” I looked up at him, confused, and then we just both started laughing. 3 months later, Dr. Rick, called my father and told him, that a generous group of people from the Mountain-film of Teluride, raised $5000 to send me to Ghana for spine surgery. I couldn’t believe it! It was the happiest day of my life! And yet, I had so many questions: Like, why was I chosen? And if I one day had the chance to thank them, what would I say? Well, here I am, today, and I wanted to say: Thank you! Thank you, for saving my life, and thank you, for giving me a second chance. But now that I stand before you, I feel that these words are not enough, and I don’t think that they ever will be. So instead, I will make a promise to you. I promise to use my second chance at life to educate myself to become the best scoliosis specialist in all of Ethiopia. I promise to help children, like me, who don’t have money for surgeries, and who are waiting on miracles, just as I was. I can promise to do this, because your gift has opened me up to a world where anything is possible! Please continue helping more children like me. Thank you!